Whether you're looking for an affordable entry level server or a high performance server for mission critical applications, the range of Dell PowerEdge servers we have in stock here at ITC Sales is sure to meet your business' needs. Available in a variety of free-standing tower and rack-capable configurations, PowerEdge servers are supported by Dell's award-winning service, offering the reliability and value you expect from a Dell product. Dell PowerEdge Servers meet a host of business priorities, such as affordability, performance, scalability, space optimisation, and support. All PowerEdge Servers are powered by Intel® Pentium® 4, Intel Xeon® or AMD Opteron 64 processors and backed by award-winning Dell service and support, offering a robust computing solution for your business' most demanding requirements. A key advantage of the Dell PowerEdge range is that it covers a range of servers which are physically different. These are either in a flat, horizontal form intended to be mounted in a rack which is fixed to the wall, or free-standing towers that sit vertically and can occupy any space in your office. Having this choice gives you a great level of flexibility and the ability to start planning for possible future expansion. It also means that the same range of products can offer an ideal solution whether you are shopping for your home office or setting up a large business office. PowerEdge Rack-Optimised Servers offer expandability along with reliability and space. 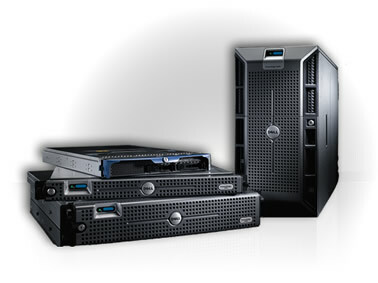 Dell offers a comprehensive line of rack servers to help match your business' performance and scalability requirements. Reliability features are available to protect mission critical applications while providing efficient use of space. ITC recommends mounting your servers into a rack in order to minimise required floor space. This is ideal for customers with multiple servers or with limited storage space. At ITC Sales we stock a wide selection of PowerEdge servers optimised for rack mounting, as well as all of the officially-recommended parts and accessories to construct your rack system. Different options are available to help you maximise performance and value for money. Essential Slim form factor (1U) servers are ideal for network infrastructure or running web-based applications. Enhanced 2U form factor models are ideal for businesses seeking increased performance and additional storage capacity. PowerEdge Tower Servers provide an easy and familiar form factor whilst retaining expandability, but without the added cost of purchasing rack equipment. Tower servers can sometimes offer more flexibility if you don’t require a large number of servers or you don’t have an ideal location to install a rack-mounted system. That being said, opting for a tower form factor does not make your servers incompatible with a rack system if you choose to adopt this later. In the event of a move to a rack- based infrastructure, you can make use of pedestal mounting kits to enable the tower to occupy five slots (5U) in a conventional rack or cabinet. Experience enterprise class features in the rack optimized 1U PowerEdge™ R320 server — ideal for your core business applications, small and large businesses alike. Get an energy efficient, dense 1U server for your applications with the PowerEdge™ R420, featuring next generation processing and flexible I/O options. Power through data intensive applications and easily scale for growing utilization with the next generation PowerEdge™ R520. Deliver reliable performance for your core business applications with the robust flexibility of the PowerEdge™ T320 tower server. Help deliver robust performance, scalability and reliability to your organization with the ample power, memory and I/O bandwidth of the PowerEdge™ T420 tower. Process everything quickly with the PowerEdge™ T620 tower server: high performance and enterprise availability with built in room for growth.